Why engage in succession planning? The mortality rate is 100%. No one lives forever and despite longer life expectancy, better health habits and medical advances, advancing age does bring more risk of diminished capacity, illness or sudden death. Many firms have been caught off guard by sudden illness, unexpected death or even the departure of key rainmakers. Succession planning helps firms be better positioned in the event of an unforeseen emergency and better control their futures by managing the associated risks. Firms need to protect their client revenue. Client relationships and loyalty are already under a great deal of strain as firms adapt to greater demands for operational efficiency and innovation. 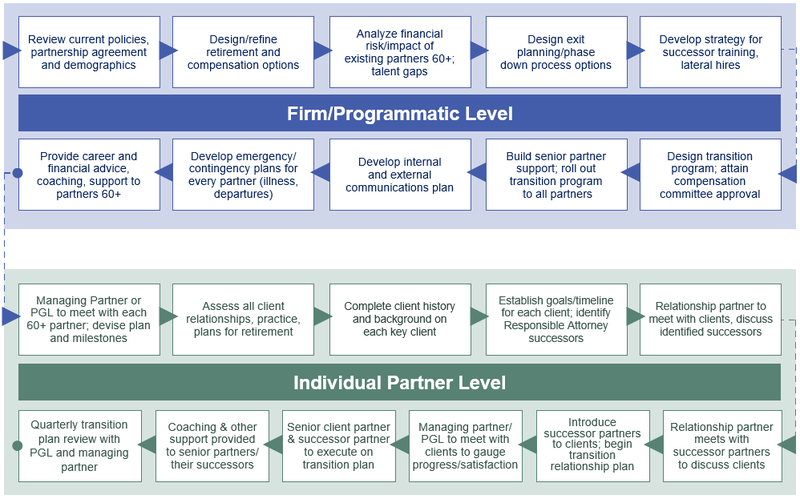 Senior rainmakers and relationship partners need to develop a team below them to understand and satisfy the changing demands of “next generation” clients. Clients want and expect their firms to be well run and managed and appreciate transparency about this. Having and articulating a sound succession plan sends a clear message to clients that the firm is looking to its future, putting the building blocks in place to adapt to changes, meet the needs of clients, transition relationships and continue its legacy. Younger partners need room to grow and lead. Too many firms today are “top heavy” with partners who often are siloed and hording work and creating bottlenecks for advancement. Given the reluctance of partners to retire (78%) and 73% don’t want to forfeit compensation by transitioning work means there are a large number of talented but frustrated partners in their 40s who are prevented from taking on key institutional client relationships (and getting the compensation credit for) and leadership roles. These partners are at risk of being recruited by other firms. Firms need to keep boomer partners happy and productive, but not allow themselves to be held captive. Succession planning should be incorporated into talent management as part of a lifetime career path and addressed effectively in compensation models and options. A flexible but structured transition program should alleviate firms’ fear that their most productive partners will leave and take their “book” to another firm. Cultural fabric unwinds and firm legacy at risk. With so much focus on PPP, productivity, rising costs, more competition and partners who strive only to maximize their own profits each year, firms are losing their collective visions and values. Unlike close, collegial partnerships of the past, many partners today don’t have confidence in their firms’ futures or a strong commitment to seeing their firms survive and prosper into the next generation. Fear, anxiety, identity. Many lawyers, especially those in the Baby Boomer generation, primarily identify as lawyers, often epitomizing the long hours and dedication to the profession. When asked, many say they have no idea what they would do if they didn’t come to the office every day or continue to practice, that they do not have hobbies or a desire to do anything different. Can’t afford to retire. Whether due to the 2008/9 financial crisis, multiple marriages and alimony support, later life children still in college, or over-indulgent life styles, many partners honestly say they cannot afford to retire. They do not have an adequate cushion to cut back or cut off their compensation and almost no firms have any type of funded retirement anymore. “My clients don’t want to work with anyone else.” Many senior partners believe that they are irreplaceable and that clients will not work with any other partner. Unfortunately, this often is true especially with partners who have controlled client relationships, often preventing the next generation of partners serving the client from having independent contact and relationships with the client. Productive senior partners leave too early. If the firm develops and announces a new policy and program without input from senior rainmakers, it risks losing partners to other firms. While no single partner should be allowed to “dictate” his or her terms, senior partners must be actively engaged with management in the discussions around succession, retirement and transitions. Unproductive partners stay too long. Without a succession plan or program, firms often have partners stay who are under-performing, not in a position or without the energy to develop new business. Having too many under-performing partners who may or may not meet minimum standards for financial contribution often is a reason firms don’t hire and advance younger partners and lawyers. Voids in leadership talent, practice expertise, knowledge. Often when a firm begins to more formally plan for succession in client relationships and practice/firm leadership, it discovers that it does not have the right personality, skills or experience levels to fill the gaps of senior partners. It is not unusual for there to be gaps of 10-25 years between a senior partner and his/her number 2 lawyer to a client relationship. There is no one way to establish and execute an effective succession program. The following provides an initial framework incorporating the some of the steps your firm could take. 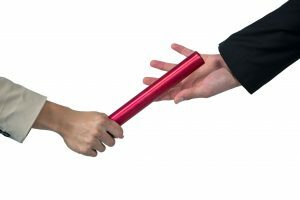 In future posts, we will describe the Five Pillars of Succession Management and each will include components of the roadmap and each of the pillars to address and execute in your firms.